OldiesMusicBlog: How long did it take to collect all the information from Mr. Consiglio? Tony and I began to pal around together in early 2000. The interviews got less formal as we traveled together, but he continued to come up with new stories for me to research and document until April 2008, so about eight years. OMB: Do you consider that Mr. Consiglio had any influence on Sinatra’s career? Tony’s main influence was calming Frank down. Early on, Tony wore bowties and Frank wore regular ties. Frank decided he liked bow ties, so he began wearing them in early 1943. 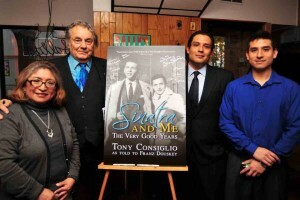 OMB: Did Mr. Consiglio have an object/ photo from Frank Sinatra to cherish the most? OMB: Did Mr. Consiglio ever mention his favorite song played by Frank Sinatra? Tony’s favorite Frank Sinatra song was Trade Winds that Frank recorded on June 27, 1940 while he was with the Tommy Dorsey Orchestra. OMB: During your conversations with Mr. Consiglio, what memory/ memories did you notice to be the most emotional for him? There were several, both joyful and sad memories. When Frank got booked at the Paramount Theater, in December 1942, that was pure joy for Tony. He loved being around Jackie Gleason because he was a happy man who enjoyed spending money. Tony was very sad when talking about Frank’s first wife, Nancy. He thought she was perfect, a good human being who took care of their children first before anything while Frank was enjoying his fame. Tony said that one time he had dinner with Nancy and Nancy, Jr., Frank, Jr., and Tina. There was a place set in front of an empty chair. Nancy said that was for Frank in case he decided to come back home. OMB: Had Mr. Consiglio said not to publish something and did you still write about it? OMB: Please give us some examples of exclusive details present in your book which were never before published. Here are a few things I learned about Sinatra in this book. 1. Sinatra enjoyed going to gay bars. He enjoyed the gay bars because two things appealed to him. One was the outrageous audacity of the performers, often imitating and mocking major stars of the day like Ethel Merman, Judy Garland, Marlene Deitrich, Cass Daley and worst of all Judy Canova. Also, Sinatra liked the atmosphere; there were some very talented people who knew how to entertain. It was interesting and risky from another aspect that we don’t think about, but gay bars were illegal in the 1940s. 2. Sinatra integrated Las Vegas hotels by threatening to close his show if Sammy Davis, Jr., Count Basie, Duke Ellington and other African-American performers weren’t allowed to sleep in the hotels where they were performing. 3. As early as 1947, Sinatra performed at benefits for the NAACP at the Apollo Theater. 4. Joseph Kennedy hired Chicago mobster Sam Giancana to help with JFK’s primary campaign in West Virginia and later help with the election in Chicago. 5. The CIA hired Chicago mobster Sam Giancana to assassinate Fidel Castro, which Sam was willing to do because Castro had nationalized the casinos once run by Giancana, Luciano, and other mob bosses. 6. JFK and Sam Giancana had simultaneous affairs with Judith Campbell Exner. 7. Tony Consiglio, who worked for Frank Sinatra and was close friends with Sam Giancana often drove Judith Exner to the White House. The relationship between Joe Kennedy, Sam Giancana, the CIA and Judith Exner are really revealing about the mob and its close ties with upper levels of U.S. government. 8. On occasion, Lana Turner preferred sleeping with women rather than with Sinatra, which turned Sinatra off completely. 9. Dean didn’t fake drinking. He was often tanked. His nickname was “Shot glass” and once he took a shower with his clothes on during one of Sinatra’s after show parties. 10. There were times during Sinatra’s career when he had to fight women off and there were other times when he paid them to spend the night with him. 11. Sinatra used parties as a way to fight off his incredible fear of being alone. 12. Sinatra paid for Joe Louis’ heart surgery, paid for Bud Abbott’s funeral as well as several funerals for Count Basie’s band members. 13. Sinatra told Sammy Davis, Jr. not to come around while he was addicted to cocaine. When Sammy Davis, Jr. died, he was a million dollars in debt. Sinatra gave Sam’s widow money so she wouldn’t lose her home. 14. Sinatra gave Buddy Rich $50,000 so Buddy could set of his band and start touring. Sinatra loved Buddy Rich’s playing but with Buddy on the road, Sinatra could spend some time with Buddy’s wife. 15. When Sinatra started losing his hair, he had his all around man, Tony Consiglio, spray paint his bald spot so the audience wouldn’t notice the shiny place on his pate when he bowed. This is a brief and incomplete list of what I learned from reading SINATRA AND ME. I think you will laugh, you will be amazed, bewildered, and like me wonder why you have never heard of the short, bald man with a camera who lived and traveled with Frank Sinatra. Tony’s nickname was “The Clam.” It was his job to take care of Sinatra and stay in the background. 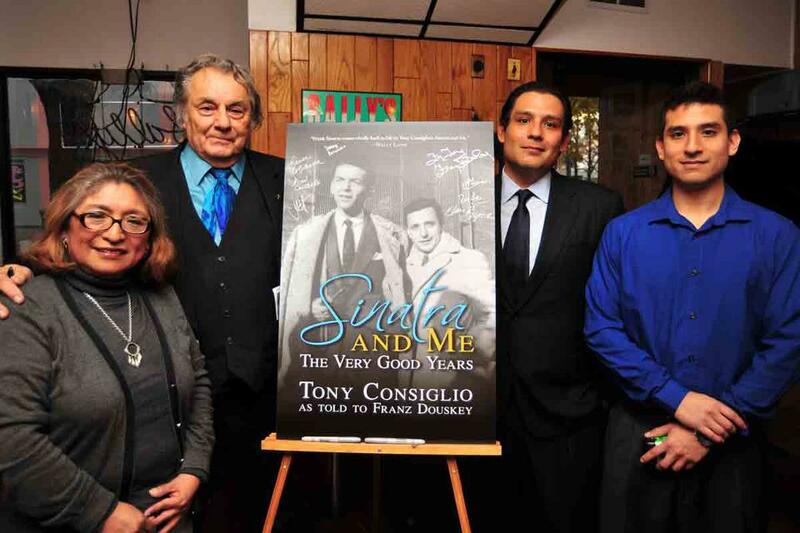 Mary Consiglio, Franz Douskey, Anthony Consiglio, and Christopher Consiglio at the “Sinatra and Me: The Very Good Years” publication party at Sally’s Apizza in New Haven, Conn (Source).